You can upload recorded sonar data to the C-MAP Genesis cloud for processing with both Mac and PC computers. Using the web-upload tool, you can upload sonar-log files directly from your account’s dashboard, eliminating the need to download and install a desktop application. Mac users must use the web-upload tool. PC users can use the web-upload tool or the Windows-based desktop upload tool. This article provides step-by-step instructions for using both upload methods. 1. Click the web-upload tool button located on the right-hand side of your Genesis dashboard, the top link under the header “Resources” (as shown in the image below). 3. Click the button labeled “Add Sonar Logs” located at the bottom-left-hand side of the “Upload Sonar Logs” page. 6. Once all your sonar-log files populate the “Upload Sonar Logs” window, click the “Start Upload” button located at the bottom left-hand corner of the window. 8. A green-shaded progress bar located near the middle of the bottom of the “Upload Sonar Logs” window will keep you apprised of how much of your data you have uploaded so far and give you an indication of how much more data remains to upload. 9. If your computer “goes to sleep” or the switches over to screen-saver mode, your upload process will likely stall out, so go into your Mac’s settings to temporarily set your screen-saver setting for “Never” when you are uploading sonar logs. 10. After each file uploads, you will get an email alerting you that the map made from that file is ready to view in your C-MAP Genesis dashboard. Once you’ve received an email about each file, the process is complete. Note: Following the enactment in 2018 of GDPR laws, Genesis users must proactively opt-in to receive notification emails. To do so, first log into your Genesis account. Next, click the “Account” button at the top, right-hand side of your Dashboard. The page that opens (see below) will include several check-boxes via which you can opt-in to several different notification email options. The check-box circled in green below relates to the notification email referenced above in Step 10. The web-upload tool works on Macs and PC computers, provided your compatible Lowrance, Simrad or B&G sonar/GPS unit is running the most up-to-date software. Software updates are free and can be found HERE. Note: Some older computers with limited RAM may see a reduction in performance, as some browsers will put the uploaded sonar-log file in memory before trying to stream it. Users with older, non-Mac computers are encouraged to use the desktop upload tool. We recommend keeping files between 50-100MBs — or approximately 1-2 hours of sonar recording. Need to make smaller file for faster upload? Check this out: Make Smaller Files Blog. 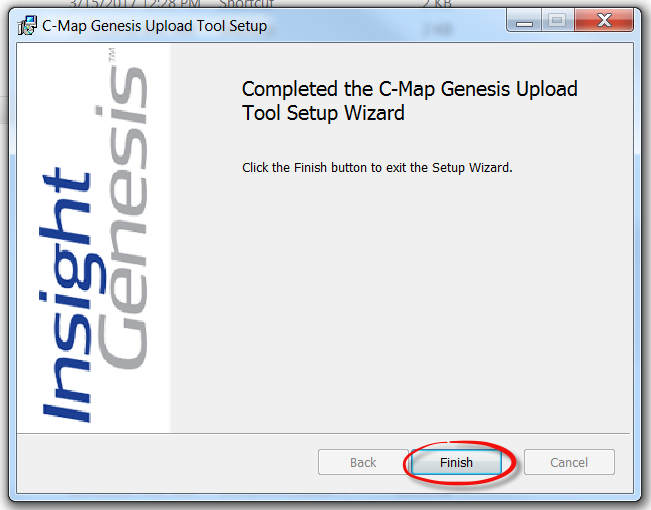 Follow the instructions below to install the C-MAP Genesis Upload Tool. This desktop-based tool will allow you to quickly and easily upload your sonar-log files (.sl2, .slg or .sl3 files) to the C-MAP Genesis website, in order to create your own custom fishing maps. This desktop-based uploader is faster than the Web Upload tool and it does not require you to leave your computer on with the screen-saver and sleep options disabled (as does the latter tool). 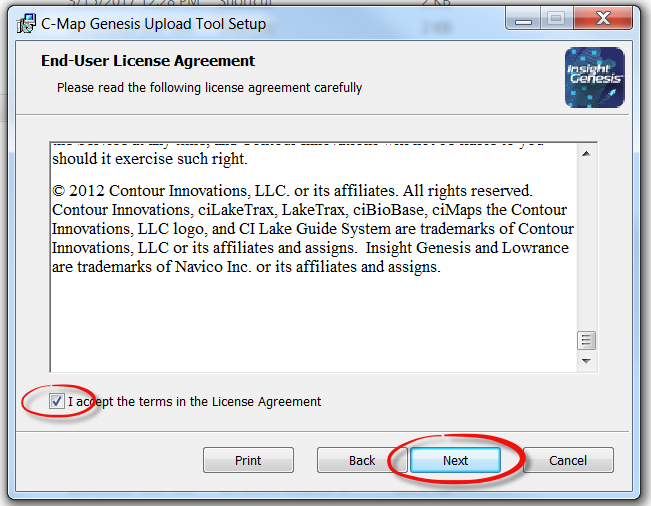 We recommend that all C-MAP Genesis users with PCs use this upload tool. 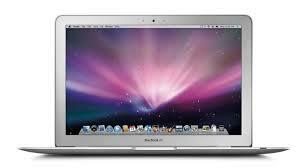 For the time being, however, Mac users are limited to the Web Upload tool. Note to College Cup competitors: You MAY use the desktop-based Upload tool on your PC — you DO NOT have to use the Web Upload tool embedded on the College Cup website. No matter which upload tool College Cup competitors use, their username and password will ensure that their sonar-log uploads count toward their total acreage in the competition. 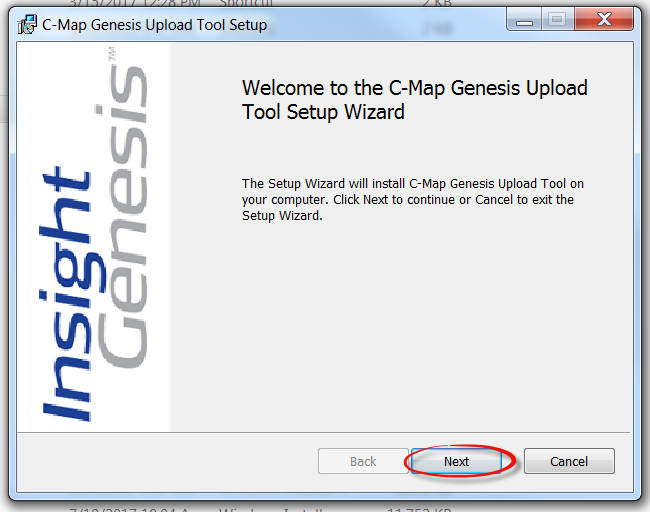 A new pop-up window will appear, with this phrase at the top: “Welcome to the C-Map Genesis Upload Tool Setup Wizard.” … Click the button marked “Next” at the bottom of the pop-up window. 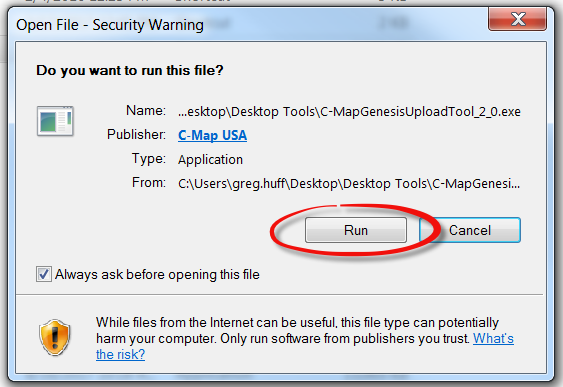 Next, you’ll see a pop-up window with the message “Ready to Install C-Map Genesis Upload Tool. Click the “Install” at the bottom of the window. To open and use the Upload Tool (pictured ablove), you will need to enter the email address and password you chose when you signed up for your C-MAP Genesis account. Once you’ve located the file(s) you want to upload, highlight it/them and click “Open” near the bottom-right side of the pop-up window. Your files should immediately begin uploading. Green bars will indicate each upload’s progress. Once all your files successfully upload, you close the Upload Tool by clicking the red X in the upper right-hand corner of the Upload Tool window. Soon, you will receive an email about every sonar file you uploaded, letting you know that it has been turned into a map and is ready to view. 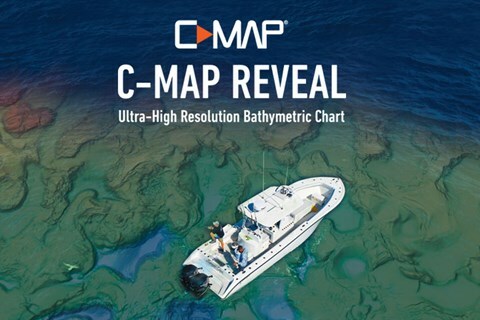 To learn how to view the maps you’ve made, merge multiple map files into a master map and how to download the map files to an SD card for use in your compatible Lowrance, Simrad or B&G sonar/GPS unit, click HERE. **Depending on your computer setting, the Upload Tool icon should load directly to your desktop. Next Post ATTEND A FREE LOWRANCE ELECTRONICS & INSIGHT GENESIS MAPPING SEMINAR NEAR YOU! Pingback: Insight Genesis is now Mac compatible! I need my custom map printed out as a paper map. Is that service still available? 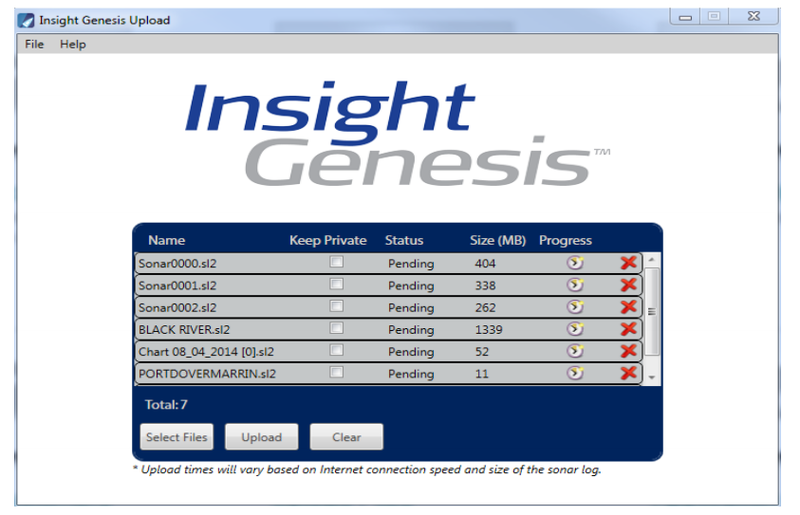 Mark: A few other Genesis users are experiencing this same issue, due to a bug with Lowrance software. The only fix we have arrived at so far is to have the Genesis user send us their files (via a free file-transfer service like WeTransfer or similar) and someone in our office must simulate the trip from the original slg/sl2/sl3 file and re-record it on an Lowrance unit without the bug in the software, and then re-upload the files. You can email me the files at Greg.Huff@navico.com … sorry for the inconvenience! I have a simrad unit. i uploaded a few logs on lake texoma and was wondering how long does it take to get an email saying they are complete and ready for download. It stated usually about 20 to 30 minutes. I have waited 6 hours and still no email. does it take longer on weekends. It is likely that you did not get a notification email because you have not yet gone into your Account settings and opting in to receive such emails. After new rules went into effect worldwide, we had to change the process in a manner that users must proactively opt into all receipt of notification emails. We will go back into this post and update to reflect the new rules.